I’ve dreamed of traveling to Ireland for as long as I can remember. A self-described Anglophile, I’m obsessed with anything British or Irish, so when it came time to decide on my big vacation for the year, I knew where I’d be heading. I picked a 10-day tour of the Emerald Isle, starting and finishing in Dublin (but just shy of the Dublin Horse Show, darn!) that covered just about every major attraction in the country, plus a couple of stops in Northern Ireland. I carefully planned my schedule so as not to interfere with my competition season, and I booked my trainer to ride my off-the-track Thoroughbred for several days of dressage boot camp. Luckily I had a really great event right before leaving, so I left with that cloud nine feeling you get after a foot-perfect cross-country round. “Are you going to ride while you’re there?” my co-workers asked. For a horse person, the logical answer would be “Yes,” but I decided against it, as I look at most of my vacations as a chance to satisfy my interest in history and culture and take a break from the constant riding, training, reading, photographing and writing about horses that consumes every day of my life. Don’t get me wrong—I love my job, having my horses at home, and learning all that I can, but there’s a lot of responsibility and never a day off! I tend to do “staycations” when I need a break from horses, and those come few and far between with my schedule of traveling to cover horse shows, competing and lessons. A “day off” for me is going up to Washington D.C., and visiting a few museums, but the horses still have to be fed in the morning and evening and turned out. So, before I left, I wrote up a detailed list for my family to keep handy while I was gone. The most important item on the list was “check for blood and lost shoes every day,” followed by some of the smaller details such as making sure Oh So has his second fan on, that the Ace is on the shelf in case they get upset about the fireworks, that the Banamine is in the fridge, and that Sam likes his belly groomed, but be careful around his face. Armed with my guidebook, iPad, passport and luggage, I left my horses in my family’s care and crossed my fingers that life would continue on as normal in my absence. For 10 days, I traveled over 1,000 miles around Ireland, taking in the cities, villages and scenic views that I’d always dreamed of. And you know what? I didn’t even think about riding! It surprised me, but with days starting at 6:30 a.m. and not ending until 10 p.m. or later, I didn’t even have time to think about normal life. 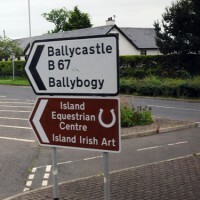 Sure, there were pamphlets for stables offering beach riding, jaunting carts in Killarney and the occasional cross-country course spotted from the highway, but it turned out to be a welcome break. Despite those thoughts, I felt like I came back refreshed and ready to tackle my next event, and my horse was no worse for wear. I was able to experience another culture and realize that sometimes you don’t know how fast you were going until you slow down.